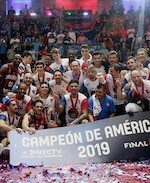 Barquisimeto, Venezuela.- Bucaneros de La Guaira's general management made important moves to complete its roster, heading towards the 2017 edition of Liga de las Americas FIBA, as part of Group C in Buenos Aires, Argentina, against Capitanes de Arecibo (Puerto Rico), Hebraica Maccabi (Uruguay) and the hosts, San Lorenzo (February 3rd-5th), by signing American-Venezuelan Donta Smith (201-SF-83, college: SE Illinois JC) and foreign players Jordan Hamilton (201-G/F-90, college: Texas), Kristoffer Lang (211-C-79, college: N.Carolina) and Marcus Hall (185-G-85, college: Colorado). Hamilton, the first player to arrive last Sunday, is a former NBA SF, 27 years old that comes from a brief stint with Guaros de Lara in Liga Sudamericana 2016 (LSB), after another short stint in Turkey's BSL with Tofus Bursa. He played for Bucaneros back in the 2016 season, averaging 20.3 points in 8 games. He played for the Denver Nuggets, Houston Rockets, Los Angeles Clippers and New Orleans Pelicans between 2012 and 2016 in the NBA. He's also played in Russia and in the D-League. Smith,a player of Venezuela's Senior National Team with previous experience in the country playing for Marinos de Anzoategui, is a 33 year-old player with broad international experience in leagues of Puerto Rico, China, Bulgaria, Australia, Mexico and Israel, as well as a short stint in the NBA, playing a couple of seasons for the Atlanta Hawks between 2004 and 2006. He will play for Bucaneros only in Liga de las Americas and will later join Piratas de Quebradillas for Puerto Rico's BSN. Kristoffer Lang has played the past few seasons in Venezuela's LPB for Cocodrilos de Caracas. He's a 37 year-old C, 2.11m tall, who had been playing for Defensor Sporting (Uruguay) in Liga Sudamericana 2016 (LSB). His career also includes appearances in leagues of Poland, South Korea, Spain, Ukraine, Turkey, Dominican Republic and Argentina. Meanwhile, Marcus Hall is a newcomer to Venezuelan basketball and has played most of his pro career in Bulgaria and Turkey. He's also played in Cyprus, Germany and the NBA's D-League. He's a PG, 1.85m tall, 31 years old.